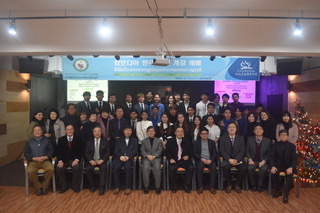 Southeast Asia Nazarene Bible College(SEANBC) took the first step toward their Cambodian diaspora community in Korea, as part of the mission of “making Christlike disciples in all nations.” Cheonan Love Church ministers to people from Cambodia who live and work in Korea. Senior pastor Sokhoeurn Chan is also working to train them for ministry for Cambodia people. Thanks to SEANBC, they are closer to their goal. After a year of prayer, on January 27 a church in which 12 of whom are enrolled at SEANBC was dedicated in Cambodia. Dr, Seungan Im, president of Korea Nazarene University, preached a message. He was joined by missions leader TaeYoung Yoon , and pastor Jeon Gwang Don, who gave the benediction. Several other Nazarene pastors were also in attendance. Like the nation of Cambodia itself, the Cambodia extension of SEANBC has known great difficulty. Today, 120 students attend classes at the two Cambodian extension centers of SEANBC. Most of them are bi-vocational ministers, working other jobs full-time while they pastor. Their passion has already produced fruit on the Cambodia district. Students of SEANBC have planted 64 churches on the district. Meanwhile, the ministry to Cambodian workers in Korea continues. According to government reports, there are 30,000 Cambodians in South Korea. Among those is Cheonan Love Church pastor Sokhoeurn Chan . After finishing his theological education in Korea, he met a Nazarene lay leader, Mr. SungBin Im, of the Gu Sung Church of the Nazarene. They felt led to found the Cheonan Love Church in 2011. Already God was showing them a new vision to make disciples of the Cambodian workers in Korea. While Dr. Bill Kwon, Korean missionary, serves as the president of SEANBC, the Cambodian extension itself is under the leadership of National Director Ko Jacob. Pastor Sokhoeurn Chan of Love Church serves as main lecturer, and classes will be facilitated with online lectures still to be developed. Students who finish with 24 courses will be granted a Diploma of Ministry, one of the ordination tracts in the Church of the Nazarene. Sokhoeurn Chan is thankful for those who helped on this journey. 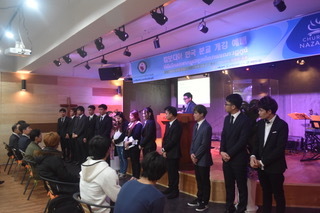 “The Cambodia extension center in Korea was possible because of the prayers and contributions of Gu Seong Church and pastor Seongyoung Seo, as well as SungBin Im.” However he and the rest of the ministers at SEANBC acknowledge most of all the grace of God in this process. They ask for prayer that these students will be receptive in their discipleship training, that they will share the gospel with other Cambodian migrant workers in Korea, and that they will draw closer to Jesus. Pray also that when they return to Cambodia after their employment, that God will use them in leadership in their own country.